The easiest and most scrumptious Nutella muffins ever made! You probably have Nutella in your cupboard at this very moment in time, right? Big chance there is also some flour in there and maybe even some eggs in the fridge. If you now can find some nuts somewhere around your house – or maybe even your garden – then congratulations! 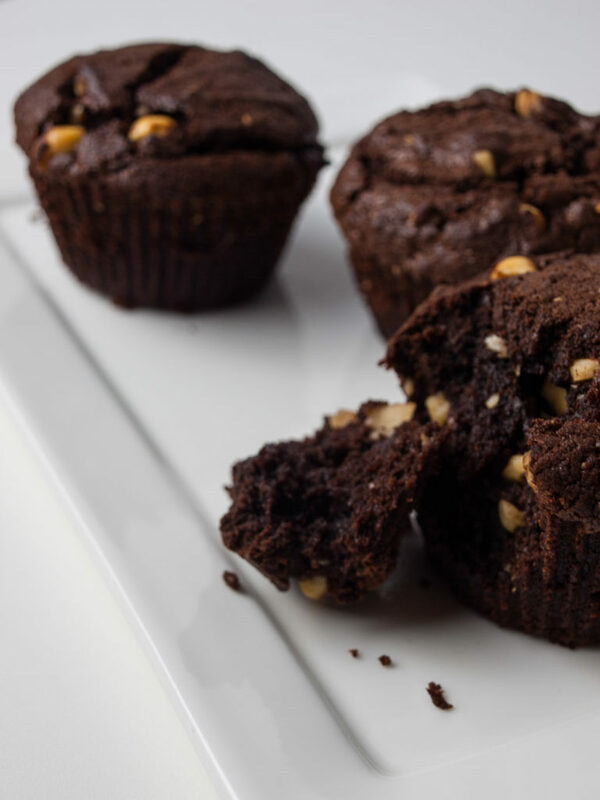 You have all the ingredients to make the easiest and most delicious Nutella muffins! This recipe is a life-saver for those times you have company on the way and won’t be able to make a grocery-run in time. Just 4 simple ingredients, some mixing and 20 minutes in the oven. Done in no-time with ingredients that you have at hand anyway + there is Nutella in there! What could be better than this? When it comes to nuts my preference in this recipe goes out to hazelnuts, as they are the main ingredient in Nutella anyway, next to fat and sugar… But enough about that, we are not watching calories today! If you don’t have hazelnuts at hand, use walnuts or any other nuts that are around! Look at these scrumptious Nutella muffins! Make some tasty Nutella batter and bake it in the oven! Preheat an oven to 175°c (fan works best). Line the molds of the muffin tray with paper cups. Put your Nutella in a mixing bowl. If your Nutella is a bit stubborn, give it 10 seconds in the microwave to soften it a bit. Crack the eggs into the bowl with the Nutella and mix in the flour until the batter is properly combined. Add the chopped nuts and stir again to incorporate them. Place a big tablespoon of batter in each muffin cup. Bake in the oven for 20 minutes. Check after 15 minutes for doneness with a toothpick. You want your muffins a bit moist in the inside. Let your muffins cool slightly before enjoying the great flavor of Nutella finally in a solid form! Let me know what you think about the recipe in the comments below! Could this recipe be any easier? Do you add any other extra ingredients to these muffins to make them even better? Let us know your suggestions, so we all can enjoy them together!